The ICMR-Vector Control Research Centre (ICMR-VCRC), Puducherry, Is Recruiting Eligible Candidates To The Various Posts. So Interested And Eligible People Can Apply For This Job Through Offline Application Form, Within The Given Time Period. 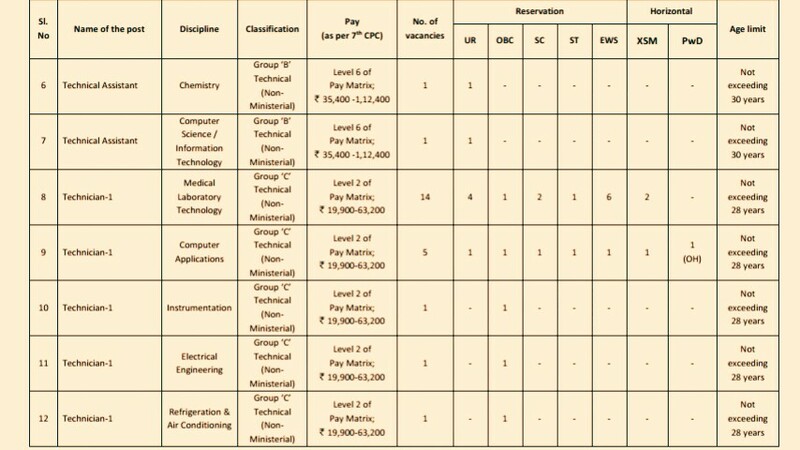 Various Posts Vacancy →56 Vacancies, Kindly Do Check Out The Image's Below For, Vacancies Distribution, Age Limit, Name Of The Posts, Scale Of Pay, And More. (Credit- The Official Advertisement Advertisement No. 03/2018-19 dated 09.03.2019). B. Eligible Criteria For VCRC Pondicherry Recruitment Notification 2019. Age Limit →Check Out The Image's For Your Concern. Mode Of Examination/Selection Process →The selection shall be made by open competitive written test for the posts of Technical Assistant / Technician-1 / Lab Attendant-1. For the post of Staff Car Driver (Ordinary Grade), selection will be made by open competitive written test followed by driving test. How To Apply/Last Date For Offline Application Form Submission →(1) Application form and other information may be downloaded from the websites “www.vcrc.res.in” and “www.icmr.nic.in”. (2) Demand Draft for ` 300/- (Rupees Three Hundred Only) towards application fee drawn in favour of “The Director, ICMR-VCRC, Puducherry” to be submitted along with duly filled-in application. SC/ST/PwD and Women candidates are exempted from payment of application fee. ICMR employees are not exempted from payment of application fee. Candidates, who wish to apply for more than one post, have to submit separate application for each post along with Demand Draft (as applicable). (i) On the over leaf of Demand Draft, the candidate must mention his/her name and post applied for. (ii) Application fee once paid will not be refunded under any circumstances nor can it be held in reserve for any other recruitment or selection process. (iii) Any other mode of payment viz., cash, money order and cheque will not be accepted. (3) Application form duly signed by the candidate with enclosures along with Demand Draft (as applicable) should be sent to “The Director, ICMR-Vector Control Research Centre, Medical Complex, Indira Nagar, Puducherry – 605 006”, so as to reach on or before 15.04.2019. (4) Self-attested copies of the following documents should be enclosed along with the application form:- (a) Proof of Date of Birth (b) Educational qualification (Degree / certificates in support of educational qualification and copies of all mark sheets for all the years) (c) Community Certificate (as applicable) (d) Self declaration for OBC candidate (Refer to Annexure “C”) (e) Income and Asset Certificate for EWS candidate (Refer to Annexure “D”) (f) Disability certificate for PwD candidate (g) Discharge certificate for Ex-Servicemen (h) Demand Draft for ` 300/- (wherever applicable) (i) Other documents, as applicable (5) Candidates belonging to reserved category (SC/ST) should submit the community certificate issued by the competent authority in the prescribed format (Annexure “A”) of Government of India for claiming fee concession. Click Here To Download Official Application Form.